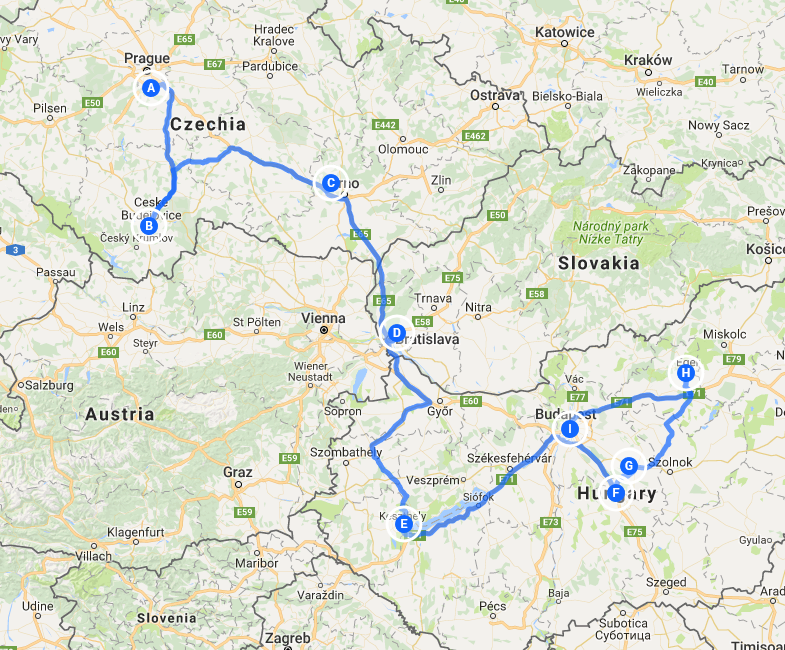 This tour is a perfect introduction to three of Central Europe’s most intriguing destinations. The Czech Republic boasts a wide range of interesting sights – historic towns, castles, monasteries and churches through to breweries, glass works and car factories; and within the tour we’ve included something for everyone. Its capital Prague lays claim to being one of the most beautiful cities in the world and once visited you will understand why. Cuisine and drinks play an important part in the life of the country, with many of the cakes and pastries popular in Central Europe originating from here. The country is also well known for its celebrated beers and excellent Moravian wines and you will have the opportunity to try these as we move through the regions. Slovakia is smaller than the Czech Republic but boasts the highest number of castles and chateaux per capita in the world, ranging from simple ruins to well preserved furnished castles. There are also numerous historical cities and towns all across Slovakia. In Bratislava, its capital, we find a beautifully restored centre full of Gothic, Baroque and Renaissance churches, houses and palaces, cobblestone streets, fountains, pleasant pavement cafes and a lively cosmopolitan atmosphere; our guided tour here will ensure you see all the very best parts. 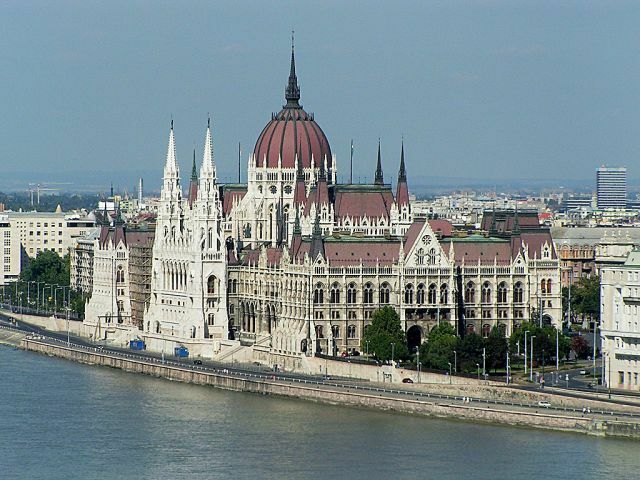 In Hungary look forward to the hospitality of the Hungarian people and seeing the country’s remarkable and varied architecture including the fabulous Festetics Palace that took over a century to build. You’ll marvel at the horsemanship of the Hungarian riders at the Tanyacsarda Ranch complex and later relax in the thermal waters and spas of Cegled. We visit Hungary’s capital Budapest and experience the many cultural influences of the country’s turbulent past. As the finale to the tour there is an evening cruise on the famous Danube River, taking you past many of Budapest’s most beautiful buildings richly illuminated against an evening sky as we enjoy our farewell dinner on board. 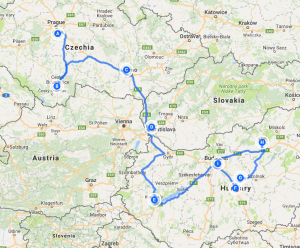 Our tour starts today in Prague and those who have chosen to travel independently (see below for optional travel from UK with Tour Directors package) should aim to arrive for mid-afternoon. 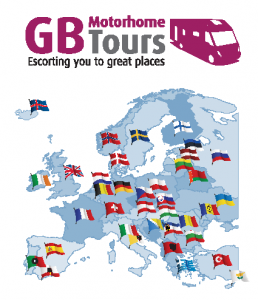 This evening we get together at the Tour Directors motorhome for introductions and a short tour briefing before making our way to the campsite’s excellent restaurant for a group dinner and our first taste of Czech food. We will be met at the campsite this morning by our guide and taken into Prague for a tour of this beautiful city. During our tour we will see the most popular and historic places including the famous Castle and the Old Town Hall. We break for lunch in a typical Prague restaurant before continuing our sightseeing throughout the afternoon. Our excursion today will be to the Skoda Factory and Car Museum in Mlada Boleslav, a short distance from Prague. We have arranged a guided tour of both the museum and factory before we move to a local Brewery for lunch followed by a tour and tasting of their beers. A free day – There are good public transport links between the campsite and Prague so you may choose to visit the city again or stay on-site and relax. We have an excursion to a Bohemian Crystal Glassworks today and the beautiful Karlestejn Castle. The Czech Republic produces some of the finest cut crystal glassware in the world and during our tour we will see the processes and learn something of its history. Moving on to Karlestejn, this large Gothic Castle was founded in 1348 as a place of safe-keeping for the Royal Treasures and today remains an imposing sight on the hillside. Before our visit to the castle we have a typical regional lunch in a local restaurant. A free day – You can walk into town and perhaps visit the brewery or just enjoy the atmosphere around the main square. This evening we have a group dinner, accompanied by Budweiser Beer or Wine, in the campsite restaurant. This morning we are taken to the fascinating town of Cesky Krumlov. The Old Town and Castle date from between the 14th and 17th centuries and are primarily in the Gothic, Renaissance and Baroque styles. We will tour the castle gardens with its unique “Revolving Theatre” before descending into the town through the castle complex. After our tour there will be free time for more sightseeing, shopping and to make your own lunch arrangements. Mid-afternoon we regroup for the onward journey to Zlata Koruna and its ancient Abbey where we will have a guided tour before being returned to the campsite. We have an excursion to the famous Moravian Karst Caves. This is a huge network of caves cut into the limestone by subterranean rivers. After our tour of the caves we have a group lunch before continuing the sightseeing journey around the region. Today is a free day and it is possible to take a bus and train, or a boat from the jetty about 100m from the campsite into the Old Town of Brno for a days’ sightseeing. Our day is spent in the city of Bratislava and with the help of our guide we will learn about the Country and its most important city. We will have a typical lunch in a city restaurant. A free day – You could re-visit the town and expand a little more on what you saw yesterday or just take it easy around the campsite. This morning we travel the short distance into town and to the famous Festetics Palace. The Palace is one of the largest Stately Mansions in Hungary and one of the few to have escaped damage during World War II. We will have a guided tour of the Palace and Coach House followed by free time which will enable you to explore more of the other exhibitions (entry fee payable locally). After leaving the Palace take a stroll through town to some of its museums and shops before returning the short distance to the campsite. Today is a free day. You could stroll down to the lakeside or if you have a bicycle you could explore a bit further afield using the lakeside cycle way. This evening we are taken to the famous Esterhazy Wine Cellar for a tour and a tastings, followed by a traditional Hungarian Buffet accompanied of course by some of the cellar’s own wines. No need to get up early this morning to prepare breakfast as you’ll be treated to a traditional “Hungarian Buffet Breakfast” in the Ranch. After breakfast we are taken on a tour of the surrounding Puszta (Plains) in horse-drawn carriages. The rest of the day is free for you to visit the stables and enjoy the facilities. A free day giving you time to relax and enjoy the Spas. This morning the “Little Tourist Train” will collect us from the campsite and take us into town where we have a guided tour of the castle and town centre. The tour will end around lunchtime and you will have free time for lunch, go shopping and explore further before returning to the campsite on foot or by the Little Train. This evening we walk a short distance to a Local Wine Cellar where we will have a Wine Tasting and light Supper, whilst being entertained by a local musician. A free day – why not stroll down into the “Valley” and visit some of the numerous Wine Cellars and sample the local wines including the famous “Bulls Blood”. This evening we have a group meal in a local restaurant. A full day guided tour of this fascinating city. Our guide will explain the history of the city and we will visit many of the most significant landmarks and monuments including the castle area. During the morning as part of our tour we will be treated to “Coffee and Cake” in the famous “Book Cafe” before continuing our sightseeing. We will have lunch in a local restaurant, followed by free time. A free day, make use of the nearby excellent public transport links to re-visit this beautiful city. There are numerous excellent tourist attractions to visit including the imposing Parliament building on the banks of the Danube and the famous “Hospital in the Rock” museum situated in the caverns under Buda castle. Today our excursion takes us to Godollo and its beautiful Palace. Often referred to as the “Hungarian Versailles” the Palace was the former summer residence of Queen Elisabeth (Sisi) and is the world’s second largest Baroque castle. From Godollo we continue our journey to the “Danube Bend” where we will visit Visigrad with its historic Castle. We will be treated to a traditional lunch in a local restaurant after which we visit Szentendre. A final free day for you to continue exploring Budapest or to simply relax ready for this evening and a wonderful Dinner Cruise on the river Danube. Whilst enjoying dinner sailing through the centre of Budapest we pass many of the cities’s most beautifully buildings richly illuminated against an evening sky. The Tour ends this morning. After saying farewell, if the Tour Directors are returning to Calais you may choose to accompany them (at your own cost) on a route and timing of their choosing, or you may make your own way from here on.